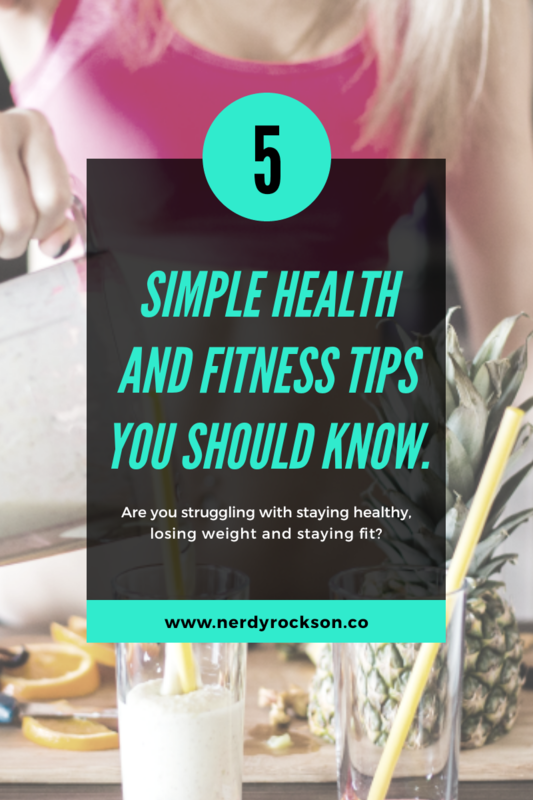 5 Simple Health and Fitness Tips You Should know. Are you struggling with staying healthy, losing weight and staying fit? Do you need to focus on just the basics of weight loss rather than all of the complicated diets out there? If so, this article is right for you. This guide will break down the 5 best fitness tips that are so simple you’ll be kicking yourself for not doing them sooner. If you want to shed weight you need to start drinking enough water like your life depends on it, because it actually does. Greater percentage of people walks around with chronic dehydration, because they don’t take enough water daily. When you don’t get enough water, your body tries to hold on to the little bit you have, making you look somewhat bloated. Water flushes the impurities out of your system and helps your gut or digestive tract work well. Drinking enough water daily is essential to staying healthy and fit. When you’re trying to lose weight it’s about steering clear from the wrong foods, not steering clear from all foods. Eating breakfast is important because it kick starts your metabolism for the day. It gets your body awake and in the game of burning calories. Breakfast also fuels your body for your morning workouts and keeps you full so you won’t snack while waiting for lunch. Eat a breakfast that’s rich in protein like an omelette or fruit and Greek yogurt. Ensure that your breakfast is balanced and rich in nutrients. You don’t want to be caught out somewhere between meals hungry and looking for food because you won’t generally find healthy options. You’ll likely end up eating junky snacks that are potentially unhealthy or eating candy out of the bowl at work. To avoid these extra calories, pack healthy snacks that you can munch on to feel full. These snacks include, fruits such as dates, nuts, almonds and so on, and healthy snack bars such as dark chocolates. 4. Engage in exercises and get sweaty. In order to reach your best fitness level, you need to exercise constantly. A blend of cardiovascular and strength training exercises will be great for improving your fitness level and the shape of your body. Not having the time or money to go to the gym is no excuse to not exercise. Instead, try free workout videos online. Many fitness groups offer workout lessons or courses for every muscle group for free. If you’re not getting the required quantity of sleep, your mental and physical health will suffer badly as a result. Experts advised that people should be getting 7-9 hours of sleep per night. Sleep helps regulate and balance every system in your body so that they work properly. If you don’t sleep enough, your body could be in a constant state of stress and disharmony and therefore hang on to your fat stores as a response. While these tips might seem basic and simple, they really are the best things you can implement to see your fitness level improve, and should not e taken for granted. It takes a combination of eating right, drinking enough water, exercising, and sleeping well to have a healthy body. Remember, not all physical problems can be fixed with diet and exercise. If you have a persistent physical issue, its best and highly recommended you go see a doctor. Let us know of your opinion below and issues you want to be discussed on this particular post. Don’t forget to like and share if this awesome post was helpful to you. Great post man... I love this article... really reminded me of some useful basic stuffs.